EMMEN, The Netherlands, October 1, 2017 (ENS) – The songbirds of Asia are disappearing from their native forests as increasingly wealthy Asians satisfy their desire to own a brilliantly colored singing bird. “The Asian songbird crisis has reached a tipping point: without immediate action, it is almost certain their voices will be silenced forever in the forest,” warned Kanitha Krishnasamy, acting Southeast Asia regional director of the wildlife monitoring nonprofit TRAFFIC. Now, the European Association of Zoos and Aquaria, together with TRAFFIC, BirdLife International and the IUCN Asian Songbird Trade Specialist Group, are collaborating to save Asian songbird species from extinction. Entitled Silent Forest, the campaign is expected to raise awareness of the devastating effects of the trade in songbirds across Southeast Asia. Campaigners hope to raise funds for field conservation projects that can reverse the decline in numbers of some of the world’s most beautiful birds. Silent Forest will run for two years and is aimed at raising €400,000 from European zoos and their visitors to help save six Critically Endangered flagship species identified by the coalition and the International Union for the Conservation of Nature, IUCN. “We aim to raise the profile of this crisis both in Europe and in the range states and have a plan in place for these birds in the form of a Conservation Strategy which feeds directly into this joint initiative,” Krishnasamy said. Birds such as the Bali Myna and Javan Green Magpie are teetering on the brink of extinction, while the White-rumped Shama was formerly widespread and common but has declined because it is highly sought after in markets across the region. * – The Bali Myna (Leucopsar rothschildi) is a Critically Endangered Indonesian songbird and one of the most iconic bird species on the planet. It owes this twin status to its extraordinary beauty, being snow-white in plumage with black primaries and tail-tips, plus a yellow-tipped bill, blue eye-ring and flowing crest. Trapping for the domestic and international cage-bird trade has played a major part in the decline of the Bali Myna to virtual extinction in the wild. * – The survival of wild Critically Endangered Nias Hill Myna (Gracula robusta) is dependent on sufficient protection of its last remaining territory on an uninhabited island off the coast of Sumatra which is a haven for many birds targeted for illegal trade. The real name and exact location of the Treasure Island will not be disclosed for security reasons. * – On Indonesia’s island of Nias, off the west coast of Sumatra, there still are some pet Nias Hill Mynas (Gracula robusta) belonging to private owners. But populations on satellite islands are depleted, the remaining captive birds are ageing, and time is of essence to establish an viable breeding population. The Nias Heritage Museum runs the island’s only publicly open animal collection and provides the only structured environmental education on the threatened species of Nias. The museum will further this work in cooperation with the KASI Foundation, Heidelberg Zoo and local, regional and national authorities. * – The Silent Forest campaign plans to establish a new facility consisting of 24 carefully designed aviaries, and associated supporting infrastructure in North Sumatra Province. These aviaries will develop and maintain a captive population of Sumatran Laughingthrush (Garrulax bicolor) and Nias Hill Myna (Gracula robusta) and house and breed other Sumatran threatened species. They will develop strategies for release and post-release monitoring and management of the rare birds. * – Over 60 experts participating the first Songbird Crisis Summit held in Singapore in 2015 and the second one in 2017 identified the most endangered species in the Greater Sunda region and recommended to strengthen their captive breeding. KASI Foundation of Taman Safari Indonesia responded with a program to start on maintaining and breeding these endangered Indonesian songbirds at a new facility, the Prigen Conservation Breeding Center. The project goal is to support the Indonesia songbird population in the wild against extinction by ensuring their captive-breeding following husbandry guidelines, building awareness in local government and communities about the existing and growing threats and about the importance of conservation action, and by gaining support from other stakeholders to contribute to the conservation program. “Funding for the breeding and conservation projects, linked to educational work in the local communities can halt and eventually reverse the decline in songbirds species, bringing back the music of the forest for the benefit of future generations,” he said. Leading biologists from the European Association of Zoos and Aquaria and elsewhere will work on scientific measures to increase protection for these avian species. Last year’s IUCN Red List update, issued in December, delivers a chilling warning about the plight faced by some of the world’s most popular cagebirds, with many much-loved species now being trapped and traded into near-extinction in the wild. In Asia, 19 species were uplisted to a higher threat category, including six to Critically Endangered, the last stop before extinction. These species are Rufous-fronted Laughingthrush (Garrulax rufifrons), Javan Pied Starling (Gracupica jalla), Black-winged Myna (Acridotheres melanopterus), Grey-backed Myna (Acridotheres tricolor), Grey-rumped Myna (Acridotheres tertius) and Nias Hill Myna (Gracula robusta). All these species are in danger of disappearing within our lifetimes, warns BirdLife International. All these species are endemic to Indonesia, and while deforestation is a factor, the main driver of their decline is the local bird trade. 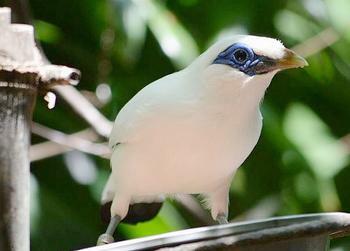 This is largely centered around Java, Sumatra and Borneo, where keeping songbirds is an integral part of local culture.